Wakizashi in Shirasaya with Koshirae. NBTHK Hozon Tokubetsu Hozon Kanteisyo. Blade length : 47.6 cm or 18.7 inches. Width at the hamachi :2.75 cm or 1.08 inches. Width at the Kissaki : 2.0 cm or 0.78 inches. Kasane : 0.63cm or 0.24 inches. Hamon :ko-nie deki and nioi deki, cho-ji midare hamon. The nioikuchi is soft. The ashi and Yo work. 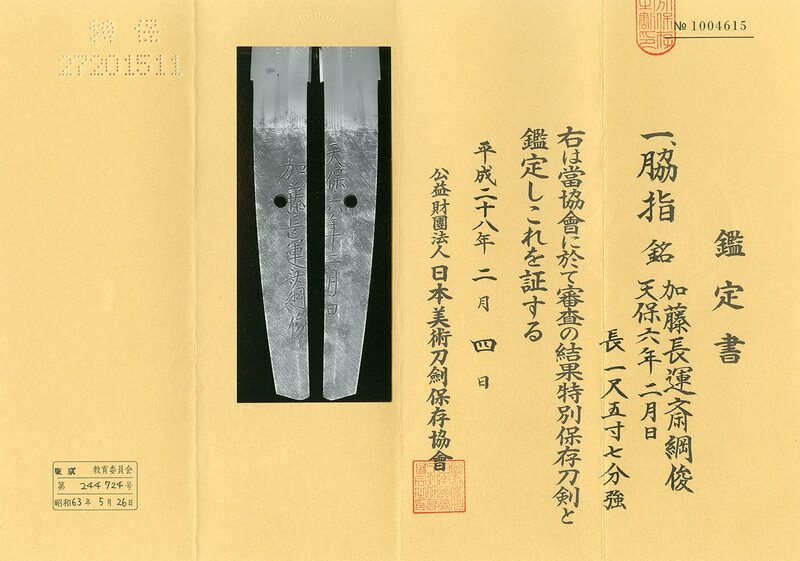 special feature:Chounsai Tsunatoshi the First forged this katana at Edo in 1846. Born Kato Hachiro in Dewa province, present Yamagata pref. as the Third son of Izumi (No) Kami Kunihide in 1798, learned under Suishinshi Masahide. Kato Tsunahide, known as its excellent Toran-ba hamon was Tsunatoshi's elder brother. Tsunehide moved to Osaka from Edo and learned under Suzuki Harukuni. After that Tsunahide went to Kyushu Island and forged sword at Kumamoto. Around 1823, he lived a house of the Uesugi family at Azabu in Edo. Tsunatoshi's excellent pupils, from his nephew Ishido Korekazu the seventh down, Koyama Munetsugu, Takahashi Naganobu, Seiryuken Moritoshi and others formed an influential school in that period that outstripped the Suishinshi school in the sphere of Bizen-den. Tsuba :iron Tsuba, rope design is engraved with gold color. Menuki : shakudo plate, rooster is engraved with gold color. Kozuka:shakudonanakoji plate, horsetail is engraved with gold color. Kogai:shakudonanakoji plate, horsetail is engraved with gold color. Back ground of age:The Tokugawa shogunate tighten the guard against foreign warships frequently appeared at that time. Aoi Bijyutsu Syoshin estimation paper :NBTHK Hozon Tokubetsu hozon paper. whole Oshigata.